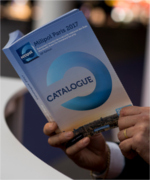 You can order the Milipol Paris 2017 official catalogue for free. It details the 1,005 companies which exhibited during the event with their information (contact details, description, products/services, etc.). Please fill the order form below (free of charge). Note that the official catalogue for Milipol Paris 2019 will be available on-site during the event.